This is one of the most simple yet delicious cooked vegetable salads you can make. 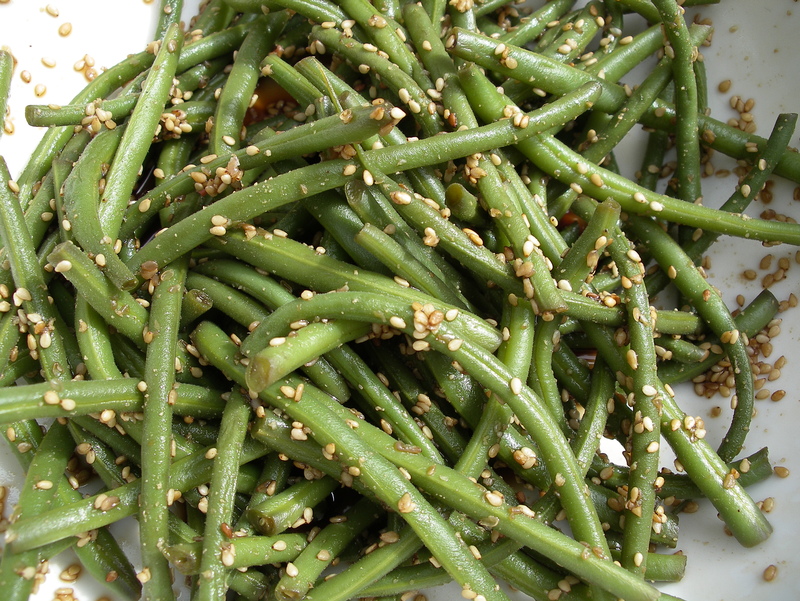 It is part of an immense repertoire of lightly cooked vegetables or ‘salads’ in Japanese cuisine and one of my favourite ways of eating green beans. This salad is best served at room temperature so it can be made in advance and keeps or travels well, so great for picnics or dinner with friends. Serve as a side to rice and grilled fish or with a number of small salads. Toast the sesame seeds in a dry frying pan or skillet until golden brown, leave to cool then lightly crush, in a pestle and mortar, to release their flavour. Pinch off the growing end from the beans and pop into a pan of boiling water for a few minutes until the beans turn bright green and a little soft but still crisp then plunge into cold water to halt cooking and preserve their colour. Toss the beans with the soy and sesame and arrange in a serving dish. Serve at room temperature. Cooks Note This dish can be made in advance and the salad will keep very well for a day so great for picnics or a packed lunch. 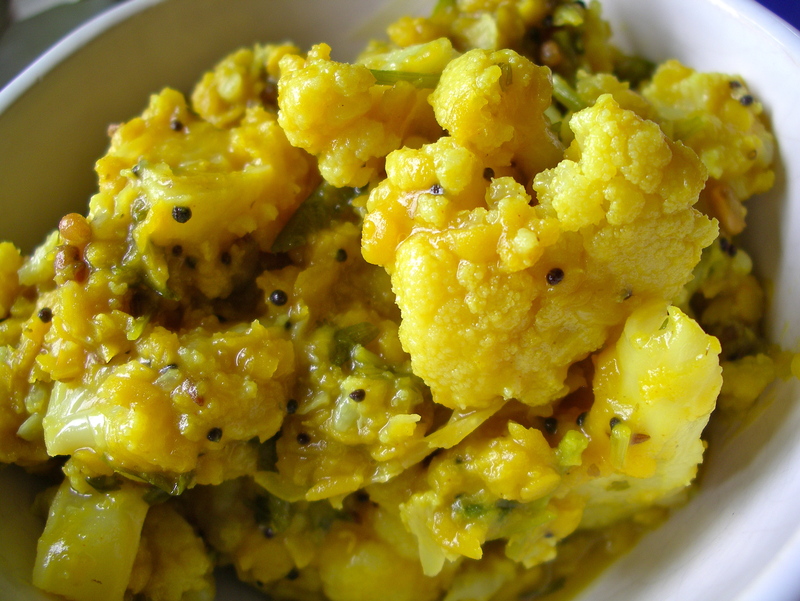 This is a delicious Indian style vegetable dish. 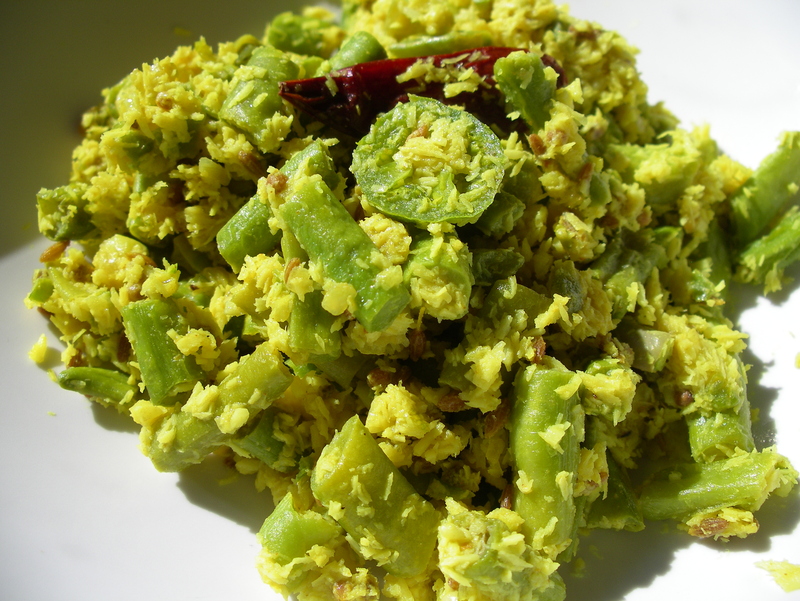 Quickly fried with fragrant subtle spices and coconut to preserve the fresh taste of green beans. Great with dals and rice. If you have one use a wok or a large wide pan. Heat a little vegetable oil and when hot throw in the dried chilli and cumin stir around until the chilli starts to darken then add the fennel and fenugreek. Don’t let the fenugreek brown or it will become bitter so quickly add the prepared beans. Stir fry until the beans turn bright green then add the coconut and green chilli cook for a minute or 2 longer but make sure not to over cook the beans. The dish will taste superb if you use fresh coconut but the dried desiccated stuff will give a good result particularly if soaked in a little water first and will need a little longer cooking. 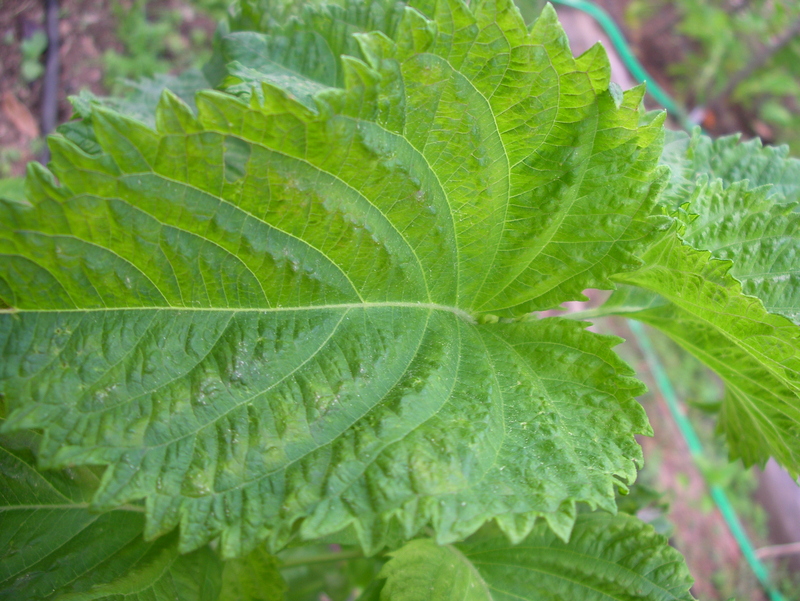 Season and sprinkle with lemon juice and serve immediately. 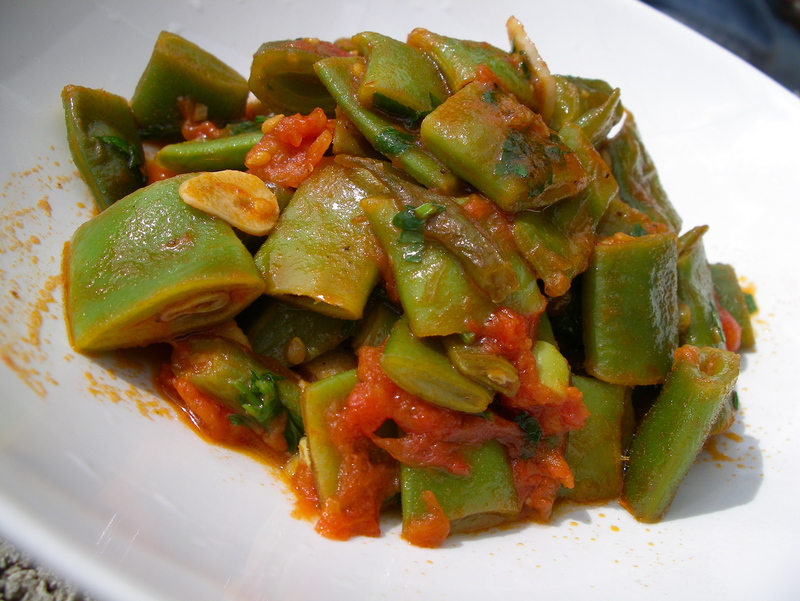 Variations You can substitute runner beans, long beans or flat beans and this recipe works well with peas, asparagus and courgettes. 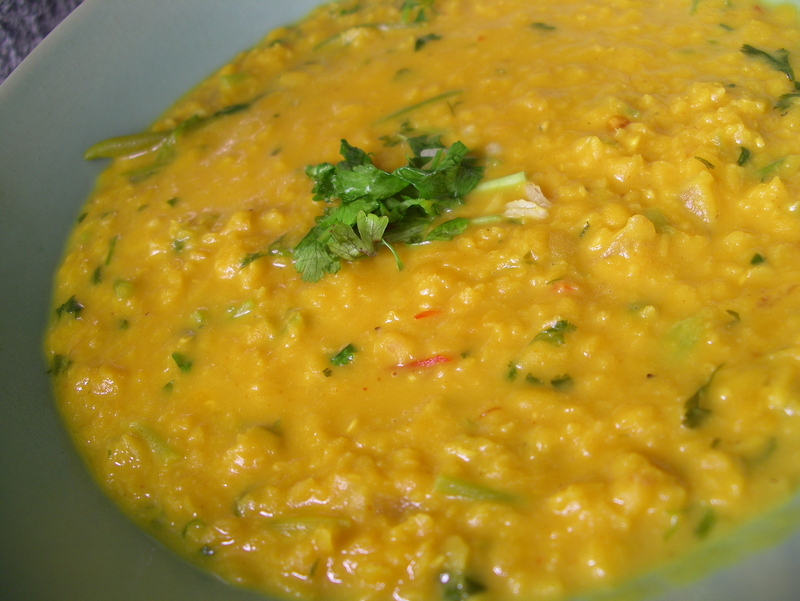 A simple soupy lentil dal flavoured with coconut milk, chilli, garlic and curry leaves. I love all kinds of dal or dhal and this one is a particular favourite with a soft rounded flavour sweet with coconut and warming subtle spices. 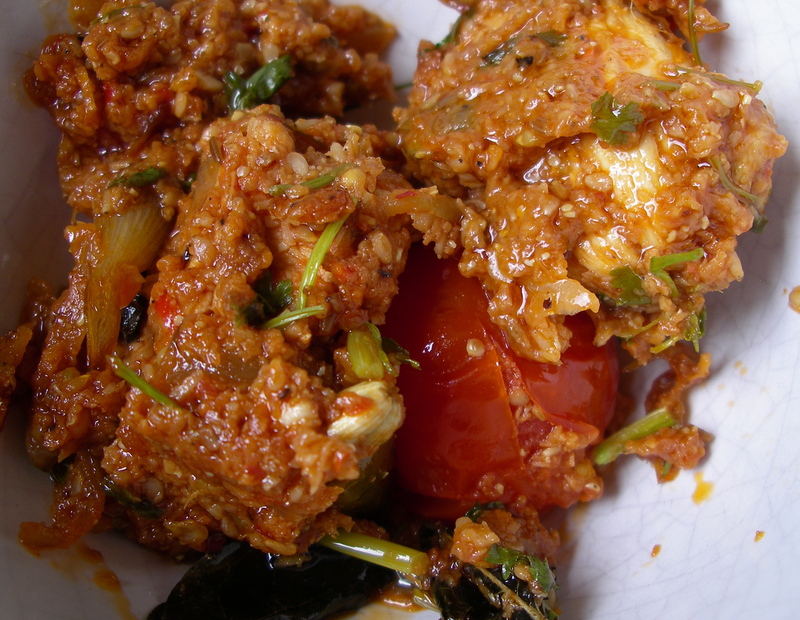 Serve with rice or Indian breads such as chapati, some pickles and a dry meat or vegetable curry. Wash the lentils and cook in a roomy pan with the turmeric chilli and water. When the lentils are soft, about 30-40 mins, add coconut milk and season to taste. In a small frying pan heat some vegetable oil or ghee and throw in the onion when it begins to colour add the garlic and when it starts to colour finally throw in the dry chillis and curry leaves fry for a minute then pour the hot oil and spices into the lentils, stir quickly, cover and let the flavours infuse before serving. Stir in a handful of fresh coriander leaf and serve scattered with a little extra fresh coriander leaf or shavings of fresh coconut. In Indonesia this dish would be called Nasi Goreng. It is one of the most popular family or street foods, almost a national dish, often eaten for breakfast, made from left-overs from the night before and found on most Indonesian or malay restaurant menues in the west. 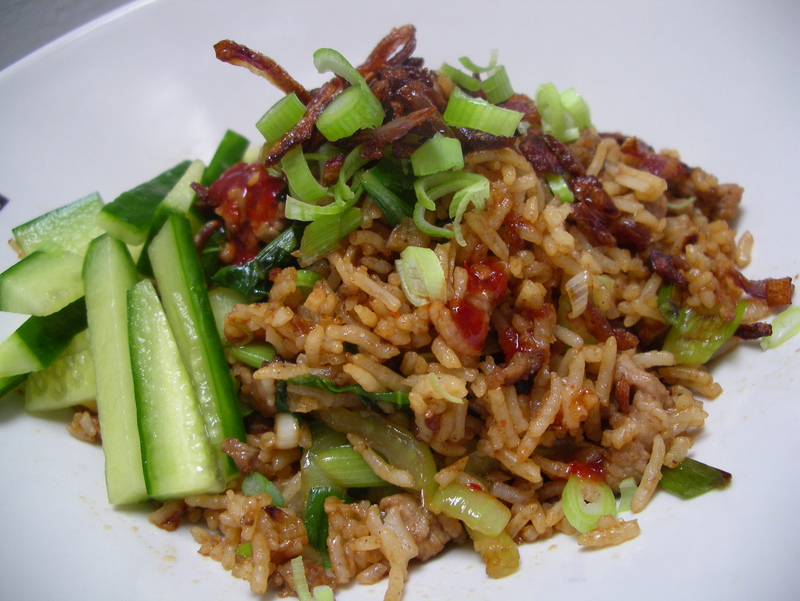 The Chinese brought their fried rice dishes to Indonesia, where they adapted to local tastes; the Indonesians cook this dish in woks but it tends to be spicier and flavoured by their sweet sticky Kecap Manis. This is a great dish, adaptable to whatever you have available, and can be made with meat, shellfish, poultry, offal or kept clean and simple with no animal products at all. The only essential ingredient is cold cooked rice making it a useful way to use left-overs and an easy to prepare breakfast or delicious packed lunch. protein you can use fried tofu, peanuts, chicken, prawn, pork or sausage. Additional flavouring use dried prawns whole or powdered or prawn paste. Toppings Serve with fresh vegetables such as; cucumber, cherry tomatoes, peppers or green onions and comdiments such as crispy fried onions and sambal olek (chilli paste), you can also serve topped with shredded egg omelet or hard boiled eggs. Cooks Note If you don’t have Katjap Mannis you can make a similar product by mixing soy sauce with sugar, and a little miso paste, garlic and chinese 5 spice) or just use soy sauce and a little sugar. 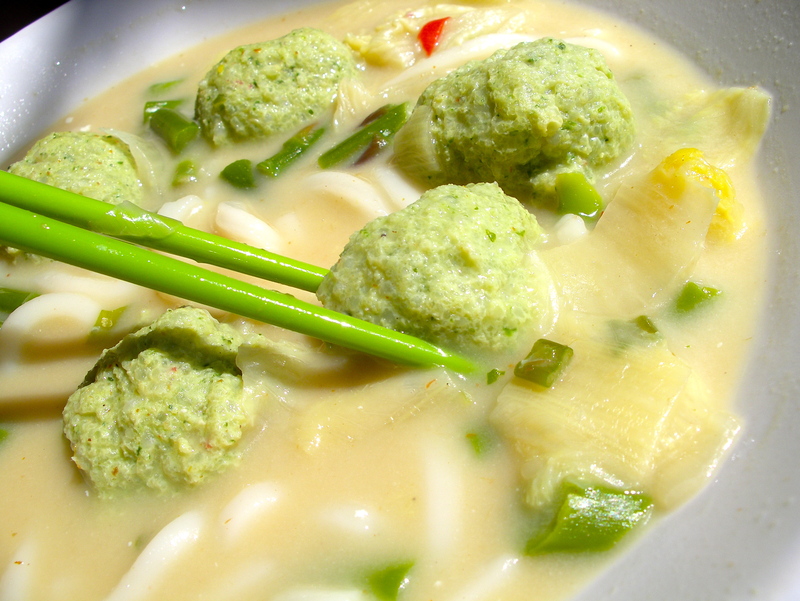 Chicken and rice dumplings simmered in a spicy coconut broth with vegetables. I came up with this recipe when I wanted to make Tom Kha Gai or chicken in coconut soup but I did not have enough chicken to feed everyone so I used rice to mix with the chicken and make tasty dumplings instead. Delicious! Bung the whole lot in a food process and pulse or finely mince all the ingredients together. Take a heaped tsp at a time, shape into balls then drop into the hot broth gently. 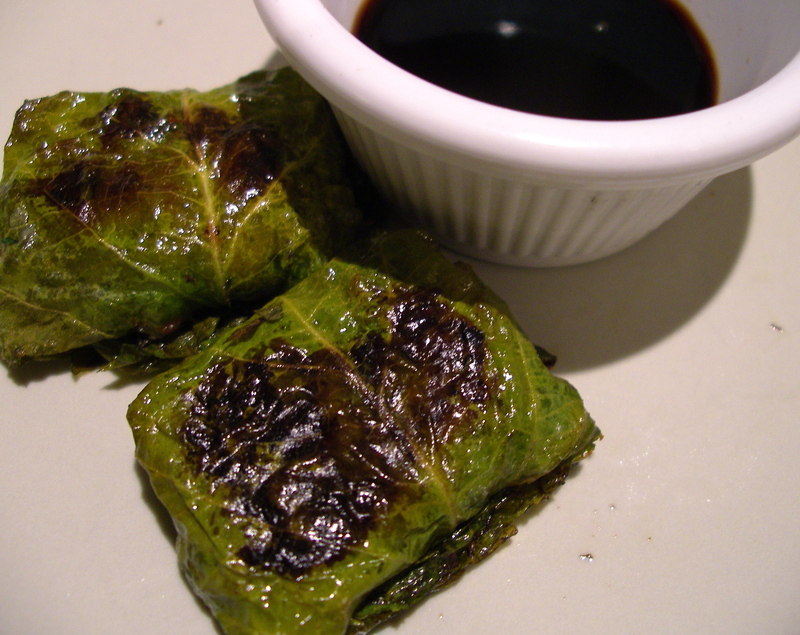 The dumplings will rise to the surface when cooked, in about 5-7 minutes. Put the ingredients for the soup broth into a roomy pan and bring to a simmer, drop the dumplings in to cook. After 5 minutes or so add some green vegetables. As soon as the vegetables are just cooked the soup is ready to serve. Check the seasoning and add a dash of fish sauce and / or a squeeze of lime to taste, ladle into bowls and scatter with a bit of fresh coriander, a few slices of red chilli or sliced spring onions. Noodles I sometimes serve this soup over noodles to make more of a meal of it. It is best to cook the noodles seperately to ensure that they don’t get over cooked any kind of oriental noodle works well, soba, vermicelli, yellow wheat noodles or big fat rice noodles. Just put a serving into each bowl and ladle the soup over them. Tip To make your own stock simmer chicken bones with an onion, galangal, lemongrass and a few peppercorns. My friend Diana gave me a jar of carob molasses to see if i could find a use for it. 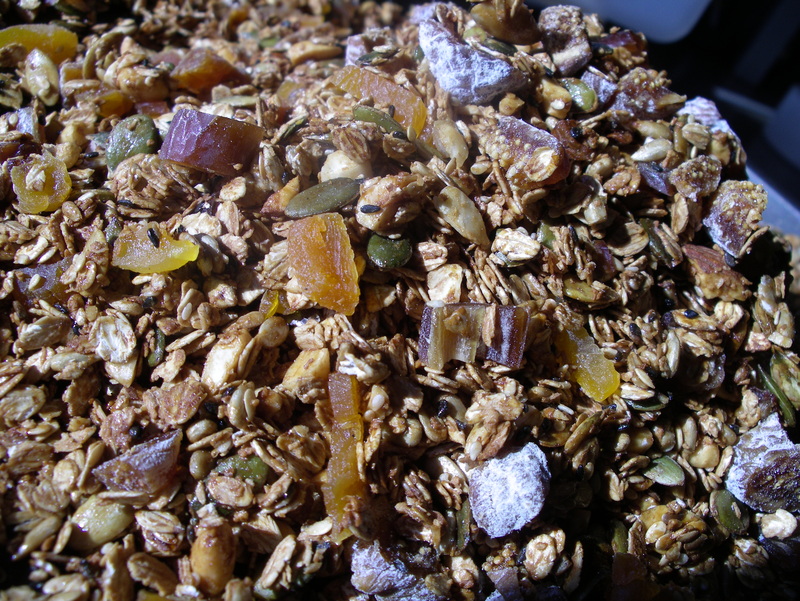 I love trying out new ingredients and seeing what can be made with them and the runny carob molasses made a most delicious crunchy breakfast cereal or granola. This is a super healthy start to the day; packed with vitamin and mineral rich seeds, nuts and dried fruit as well as slow burn carbs so keeps you going right through till lunch. Mix the oats, seeds and nuts in a large bowl. Drizzle in the molasses or honey and mix well until all the dry ingredients have been coated in the sweet stuff. Spread out on a baking tray (2 trays for this quantity) and bake in a low oven 150c for 20-30 minutes. Take it out at the half way point and give a good stir to make sure the cereal is cooking evenly. Towards the end of cooking keep an eye on it as you don’t want the oats or nuts to burn, which will give it a horrible taste. While it is cooking chop the dried fruit into bite sized bits. Remove from the oven, give it another good stir and leave to cool for a few minutes then stir in the chopped fruit. As the cereal cools the toasted oats and nuts will crisp up. When completely cool and crisp decant into an airtight tin or jar. The granola keeps well for several months. Variations for an exotic version add dried pineapple, cashews and ribbons of coconut. The next batch I make I will try using rolled barley flakes. Note 1 cup = 8 tbsp. This quantity makes about 30 portions. Cooking times may vary according to your oven.